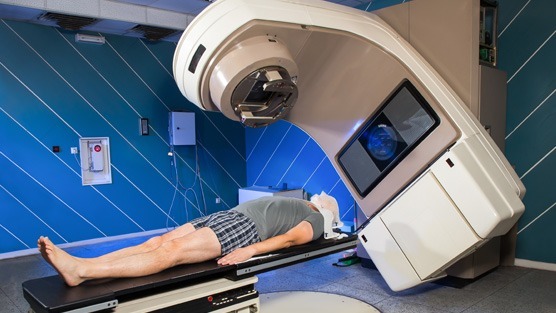 You are here: Home / Mens Health / What is External Beam Radiation? External beam radiation or External beam therapy (EBT) as a treatment for prostate cancer incorporates the use of high energy X-rays to kill cancerous cells within the prostate gland. A machine called a linear accelerator generates these high energy X-rays externally which are then directly aimed at a localised area of the prostate gland. The radiation destroys cancerous cells by eliminating the genetic material that controls both cellular growth and division. However, healthy cells are also affected in the process which as a result of treatment can have side effects. This procedure can be recommended by your doctor for varying reasons and can be used as primary treatment when prostate cancer is in the early stages, used in combination with other treatment methods or after surgery when there is recurrence of prostate cancer indicated by elevated PSA levels. Radiation simulation: A few days before treatment several marker seeds will be embedded directly into the prostate by the radiologist. These markers are used to accurately locate the prostate gland during every treatment session. Imaging: Your radiation therapy team will then take computerized tomography (CT) images of the area of the body where the treatment will be focused. Treatment is given on an outpatient basis and is done five days a week over the course of seven to nine weeks. Each treatment session will generally run an hour at most however most of that that time is spent preparing. In actuality the actual treatment portion of the procedure will only last several minutes. During each session you will lie immobilized in a position that was determined during radiation simulation. A customized immobilization device may also be used with each session to ensure the same position is held during treatment. The linear accelerator will then begin to rotate around the body administering beams of radiation from several different angles. You will also be able to communicate with your radiologist during the procedure so you’ll be able to convey any discomfort or pain that might occur. You will have follow-up visits post treatment so your doctor can determine if your condition has stabilized. During these visits your condition will also be evaluated and can include a blood test to determine if the cancer is in remission or if further treatment may be required. You can also discuss any side effects you may be experiencing and ask your doctor about available treatment options.